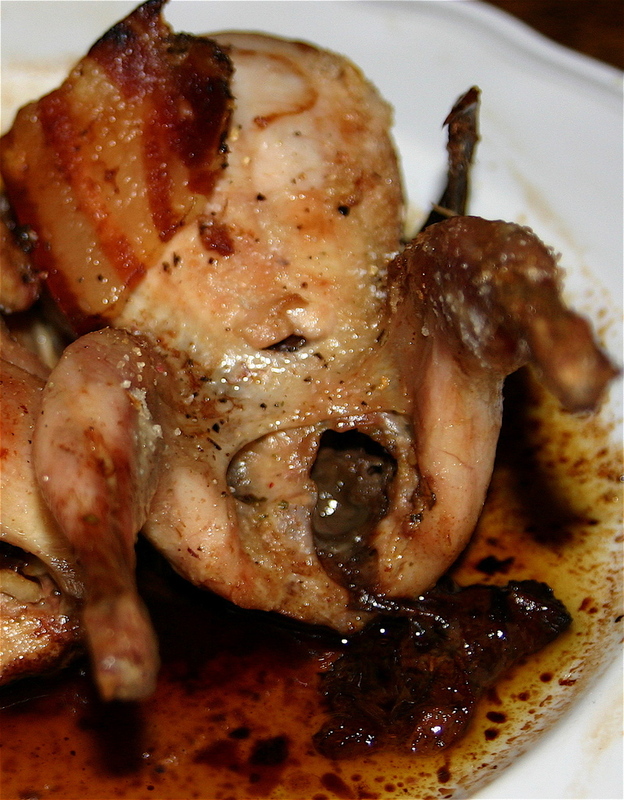 How do you photograph roast quail so that it doesn’t look quasi-pornographic? Maybe that’s why food stylists get the big bucks. Regardless, this is an excellent version of roast quail. Clean and wash the quail, removing any remaining organs. Place in a bowl and add the salt, peppercorns and vinegar. Pour in enough water to cover the little birdies and place them either in the freezer or add ice cubes to the mix. You don’t want the birds to freeze solid, but you want to get them close to the freezing point. Chop the prunes and garlic up into a nice mush. Divide the mix into quarters and stuff a quarter amount into each bird. Massage the bird with some salt and pepper and lay a little square of pancetta on its back. Give everything a little drizzle of olive oil. If the birds are very plump, you don’t need the pancetta, its only necessary when the birds are lean and in need of a little extra fat. Turn the oven down to 350F and roast for 45 minutes. Prior to serving, plate the birds and keep them warm. Deglaze the pan with the armangac (or cognac or brandy) and cook until the alcohol evaporates (1-2 minutes). Lap the sauce around the birds and serve. P.S. Do not serve this dish on a first date. There is a lot of finger licking and other noises that might give the wrong impression.